I have already accomplished some stuff from our Spring Bucket List. First, I'm back at running 3-5 miles at a time -- and it feels good. Second: My mother-in-law, Ada, and I planted seeds last weekend. 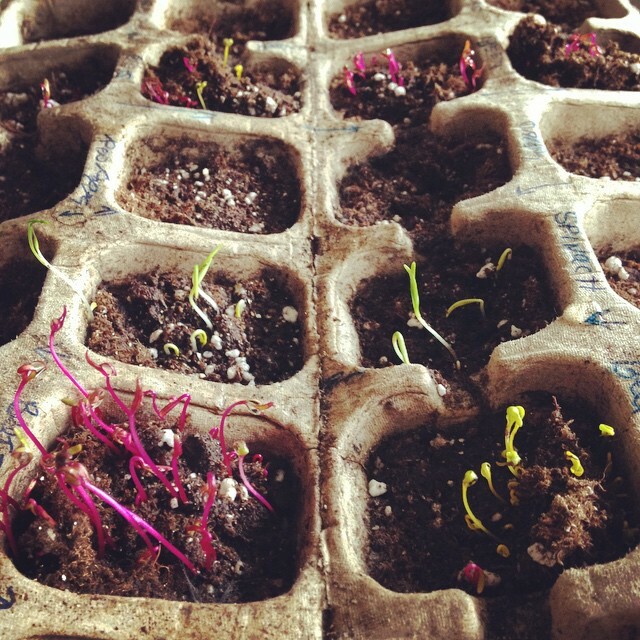 They are living on my dining room table + sprouted up almost immediately! I definitely need to separate out some of the plants to prevent crowding (Ada was a little too enthusiastic with her seed pouring job), but otherwise, I think we’ll get some healthy plants out of this bunch. Beets, parsnips, spinach, swiss chard, peppers, pumpkins, and a wide variety of herbs. #4: Sherlock is our new favorite show. Benedict Cumberbatch = !!! #6: Have you guys heard of Poo-Pourri? We got it as a stocking gift, and now I spritz it in the kitchen sink and garbage can for odors (along with its original purpose, of course). #8: My growing obsession with plantation shutters. Up to 60% off EX9 Kinesiology Tape -- I dig it. Helps with lots of aches/pains. 100 piece set of Picasso Tiles is 35% off -- such a great toy. Ninja 1100 Watt Blender just $116 -- we use ours every single day (for 5+ years). On my wish list: Zero Gravity Chair that’s 36% off today. Kitchen Updates -- most recent photos of our (budget) renovated space. Kale Massage 101 -- why you should massage kale + how to do it. Dark Cloud -- ever feel like bad stuff is just following you everywhere? Miso + Peanut Noodles -- a healthy, nostalgic recipe. Moving Forward // Or Trying -- it’s hard when pregnancy announcements are everywhere.